To retrieve posts for last year and previous years, click the links below. 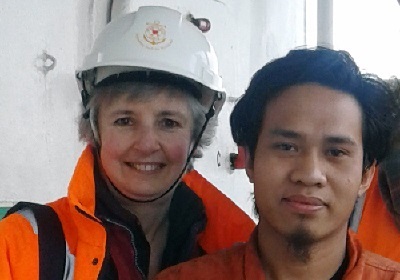 We provide practical and pastoral care to all seafarers, regardless of nationality, belief or race. Our port chaplains and volunteer ship visitors welcome seafarers, offer welfare services and advice, practical help, care and friendship. The Apostleship of the Sea in Great Britain is part of an international network known to the maritime world as Stella Maris. working in more than 250 ports around the world. In the last year the Apostleship of the Sea chaplains and volunteers made over 10,000 ship visits to in over 50 ports in the UK. Apostleship of the Sea provided support for a group of seafarers who were left stranded on board their ship for more than three months at Newport docks. The Sunflower E, an Italian cargo ship, was detained at Newport in March after legal claims were made against it. The crew from Philippines, Indonesia and Romania, had also not been paid their wages since January. Barbara Thomas, AoS ship visitor in Cardiff visited the ship, Sunflower E, regularly to provide them with material, spiritual and emotional support. "I spent time speaking to the crew about their concerns, their families and ensuring they had the means to make contact with home. Although food was provided, I brought food for a diabetic crew member. Parishioners in my own parish - St Philip Evans in Cardiff - also gave cash donations to the crew," she said. Barbara said that one Filipino crew member was seriously ill on arrival at the port and ended up having chemotherapy in hospital. "I visited him there and used my contacts with some of the local Filipino community to see him regularly before he was flown home," she said, adding that they also helped the rest of the crew with cash, gifts and meals. "Visits became increasingly important to them and a chance for them to vent their feelings was vital in keeping them going. They were assured that they were not forgotten and that everything possible was being done and would be done to help them." Barbara also provided three crew members with transport to and from Mass at St Patrick's Church in Newport. She arranged for a crew member to attend the Romanian Orthodox Midnight Mass for the Orthodox Easter celebration. She organised for local Catholics to provide transport to Mass on Sundays for crew members wishing to attend. This invitation was taken up almost every Sunday from Easter until they were repatriated on June 25. They were invited back to peoples' houses for Sunday lunch too - something they really appreciated. The crew were repatriated on June 25 and are now reunited with their families. In an email, one crew member writes, "I am home now. It was quite a long flight but worth it because I'm with my family right now. One good thing that's come out of me being stuck for three and a half months was I found friends and met good people like you. I will always remember and cherish all the good things you've done to all of us. Thank you so much and God bless each one of you and your families." Allen Ford spoke at all Masses today appealing for prayers for seafarers and donations for the Apostleship of the Sea, an agency of the Catholic Church and also a registered charity. He described how the Apostleship of the Sea provides spiritual and welfare support for seafarers of all nationalities and beliefs in 50 ports of the United Kingdom and many other ports worldwide. 95% of the world ‘s trade is still carried in ships and the crews are drawn from some of the poorest nations. Wages are low and the seamen are away from home for long periods. Allen is one of a team of three volunteer ship visitors for the Apostleship of the Sea who visit the ships in Portland every week and also visit any sick or injured seamen taken to Dorchester Hospital by the Coastguard helicopter. “We recently visited a small cargo vessel in Portland. We sensed that something was wrong and, as we were leaving, a Guyanese seaman beckoned us over and furtively handed us a note ’this money is real small and under-paying. We need help. Someone needs to do something ‘. We informed the International Transport Federation, a seafarers ‘ trade union organisation, and it took action with the ship ‘s owner to enforce the wages contract. “Just over a year ago we helped look after the crew of the cargo vessel WESTWIND II which was alongside in Portland for eight months without the crew being paid. There has recently been an even longer case in Shoreham where the Apostleship of the Sea has given assistance. “We are currently visiting each week two Chinese built cargo vessels that have been laid up in Portland for over a year with a small Polish crew. The crew are being paid but conditions on board are far from good and the crew are always pleased to see us during our weekly port visits and to be taken on excursions to Stonehenge or Maiden Castle. “When you look out across Weymouth Bay and see ships at anchor. Please think of the Seamen and remember them in your prayers. They are probably a long way from home and poorly paid. We find most cargo ships now have Ukrainian Officers and a Filipino crew, sailing under a flag of convenience as that is the cheapest option for the owners. “In her recent book ’Deep Sea and Foreign Going ‘, author Rose George writes about modern seafaring. Fr Colum Kelly, Apostleship of the Sea ‘s port chaplain in Immingham, told her how a ship ‘s Indian crew asked him to take them to walk barefoot on green grass for an hour in contrast to the steel of the ship. Fr Colum told her ’never underestimate the value of a small gesture ‘. “During the last year we made over 100 visits to ships in Portland, whilst Apostleship of the Sea chaplains and volunteers made over 10,000 ship visits in over 50 ports in Britain. This appeal raised £1175.43, a magnificent sum. Thank you parishioners of Our Lady, Star of the Sea! 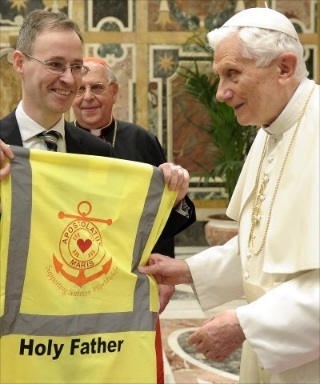 Pope Benedict XVI has praised the work of Apostleship of the Sea with seafarers. “Today too the Church sails across the seas to bring the Gospel to all nations, and your presence in ports throughout the world, your daily visits to ships docked in these ports and the fraternal welcome you give to the crews whilst in port are a visible sign of your concern for those who are not able to receive ordinary pastoral care. “The vulnerability of seafarers, fishermen and sailors must encourage even greater concern on the part of the Church and stimulate the maternal care that, through you, s he shows to those you meet in ports and on board ships, or assist during long periods at sea”. “I guarantee the Church will remain close to fishermen who seek dignified and safe working conditions, safeguarding the value of the family and the environment and defending the dignity of each individual”. The Apostleship of the Sea’s 23rd international congress attracted over 400 delegates from 70 countries. 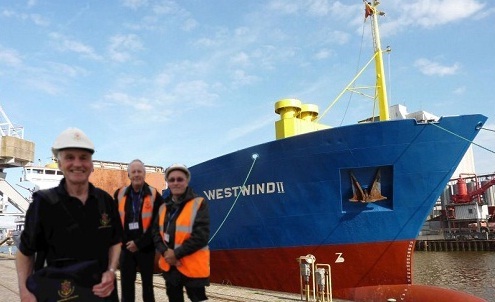 The Weymouth Branch of the Apostleship of the Sea have been helping sailors in need when their ship, the M/V Westwind II ran aground in Weymouth bay, destroying mussel and oyster beds and eventually being arrested by the Admiralty Marshall. Eventually a court ruled the ship should be sold for £500,000 and the proceeds used to pay compensation for the damage and to pay the crew’s wages. The 5 crew members from Turkey and Georgia were stranded for over 5 months without pay. They were told if they were to leave the ship they would not be paid. John Green, of the Apostleship of the Sea charity, said that each year ship visitors make some 200 visits to ships calling at Weymouth and Portland alone. The volunteer ship visitors of the Apostleship of the Sea visit ships in 50 ports around the coast of Great Britain and support many thousands of merchant seafarers who can suffer dangerous working conditions, low pay, poor morale, sickness, and separation from family. Mark Kemmis-Betty, of the charity, (and seen in the foreground of the picture with Ian Hollows and Allen Ford) said: “We were so glad to help the crew of the Westwind II. It is such a relief that they have gone home now and will be paid”.